NCAA's "Getting the Call Right" rule regarding runner placement on a reversed no catch call may have incidentally put the offensive team at a disadvantage during the Gainesville Super Regional, as a Florida baserunner was forced to return to a base he likely would have advanced from if not for an NCAA-specific rule specifically prohibiting such advancement. Wake Forest requests a replay reversal. The Play: With none out and two on (R1, R2), the batter flies to right field, whereupon the outfielder drops the ball in the process of catching and transferring the ball to his throwing hand, ruled "no catch" (safe) by the first base umpire. The baserunner from second successfully advances to third base, while runner R1 fails to vacate first base (forced to do so due to the batter becoming an unretired runner), and the defense tags second base for the force out: score it a fielder's choice to make the situation one out, R1, R3. 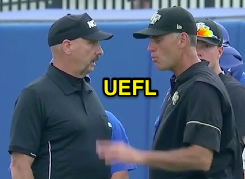 Replay Review: The defensive (Wake Forest) coach argues that the right fielder caught the ball and dropped it during the transfer process, alleging the proper call should have been a fly out. After video review, the umpires reverse the on-field ruling, declare the batter out, and send the two base runners back to the bases they occupied at the beginning of the play: One out, R1, R2. Florida questions the runner placement rule. 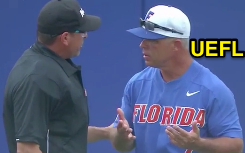 Logical Argument: The offensive (Florida) coach in turn argues that R2 successfully ran to third base during the play, and would have ended up on third base no matter the call in the outfield: he would have either advanced due to his being forced to do so, or as a result of tagging up with a play that deep into right field. d) All base runners shall be returned to the base they occupied at the time of the pitch. Analysis: Accordingly, college baseball's Getting the Call Right rule requires that on a reversed no catch-to-catch call, the runners be returned to the bases occupied at time of pitch (TOP). This is a mandatory provision of the rule and not subject to further interpretation, negotiation, or crew chief discretion. Therefore, R1 was correctly returned to first base and R2 was correctly returned to second base. Commentary: The intent of the Getting the Call Right rule in regards to no catch/catch is to declare the play dead immediately upon the incorrect call being made, so as not to put any team in jeopardy by having the offense run into an unnecessary out (failing to tag up, trying to take an extra base, passing a preceding runner, etc.) or the defense into committing an unnecessary play (errors or throws to bases) that could further confuse or complicate the situation (and then having to adjudicate such contingencies). By killing play immediately, the rule effectively takes discretion away from the umpires, who have erred during the original play, so as to take all potential arguments away from impacted teams. Batter out, runners returned to their bases at TOP, end of discussion. Naturally, this unique play—wherein the situation would likely have ended up as one out, R1, R3 no matter what the first base umpire's catch/no catch call was—pigeonholed the crew into (correctly) applying a rule that likely was not intended to address this precise all-else-equal type of play (or, if it was designed to govern the identical-outcome play, then perhaps the rule should be changed). MLB and NFHS codes do not have this rule. 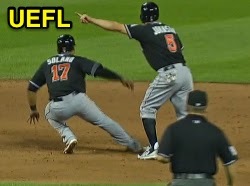 MLB Difference: In Major League Baseball, Replay Regulation IV.A tasks the Replay Official with runner placement responsibility, with the following standard: "the Replay Official shall place the base runners on the bases he believes they would have reached had the reviewed call been made correctly." Under the Official Baseball Rules, there is no requirement to return runners to their TOP bases in the event of a reversed no catch call; thus, had this play occurred at the professional level, the runners likely would have been placed at first and third base if the Replay Official deemed that the runners would have ended up at those bases had the correct call been made in real-time. This discretionary authority also applies to the minor leagues and non-Replay plays, pursuant to OBR 8.02(c), which states, "If the umpires consult after a play and change a call that had been made, then they have the authority to take all steps that they may deem necessary, in their discretion, to eliminate the results and consequences of the earlier call that they are reversing, including placing runners where they think those runners would have been after the play, had the ultimate call been made as the initial call." NFHS Rule: In high school, there is similarly no return-of-runners rule for reversed no catch calls. Instead, discretionary authority is delegated to the umpire-in-chief, who shall "Rectify any situation in which an umpire’s decision that was reversed has placed either team at a disadvantage" (Rule 10-2-3-l). Thus, the return-of-runners to TOP on a no catch-to-catch reversal is, for now, an NCAA exclusive.